The Transportation Association of Canada Foundation's scholarship program awards over $110,000 annually to deserving college or university undergraduates and graduates. 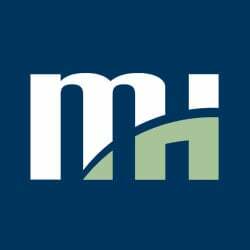 This is made possible by industry donor’s, such as Morrison Hershfield, who annually sponsor a scholarship category. Morrison Hershfield's sponsored scholarship category focuses on Structural Engineering with a special interest in bridges and transportation-related structures. 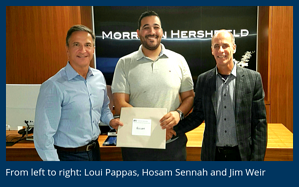 It was announced in July that Hosam Sennah was the winner and consequently, he was invited to the Morrison Hershfield head office “We were so pleased to meet Hosam and show him around the office.” Jim Weir, Senior Vice President, Transportation and Structures, and Loui Pappas, Vice President, Business Development greeted him and conducted an office tour, where Hosam met with many of our colleagues in the transportation and structures department. He also had the opportunity to meet and chat with our CEO Anthony Karakatsanis. 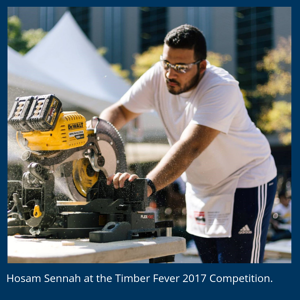 Hosam is in his fourth year at Ryerson University in the Bachelor of Civil Engineering Program. He has made the Dean’s list for three consecutive years in recognition of high academic achievement. He also volunteers on the Canadian Society for Civil Engineering (CSCE) Ryerson Chapter as the Vice President of Strategic Development. Hosam is a worthy award recipient, as these are only two of the many accolades on his impressive resume. 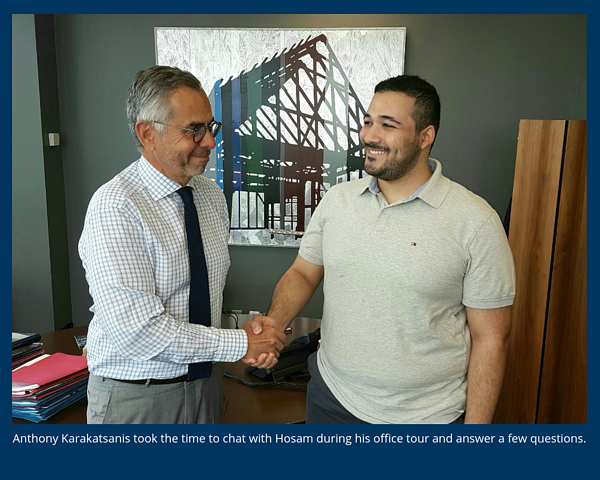 Recently, Hosam was part of a team that completed a geotechnical research project on the failure of pile foundations, where they used MTO pile load test data to predict pile failure. The team developed their own Excel program to analyse the data. The sponsorship winner is selected by the TAC Foundation who evaluates and scores all qualifying applications. To learn more about all the available scholarships, and apply for next year, visit the TAC Foundation’s Scholarship page. We wish Hosam Sennah the best of luck in the last year of his program and with the upcoming Capstone semesters, his final project in the Civil Engineering Program.